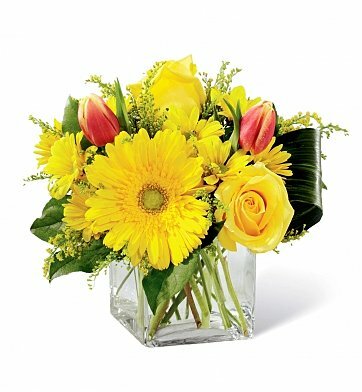 A bold rush of yellow, this vibrant flower bouquet exudes fun and beauty to everyone's day. Arranged beautifully in a clear glass cubed vase to give it a modern trend forward look they will adore, this spring flower bouquet is ready to celebrate! Tropical Leaves, Lush Greenery and more. Standard Arrangement Measures 9" x 8". Sunshine Bouquet is a hand delivered gift. These gifts are delivered by one of our local design centers located throughout the United States and Canada. Same day delivery is available for most gifts when ordered before the cutoff time. The cutoff time for Sunshine Bouquet is 2 PM in the recipient's time zone.